Review: What makes “Renai Circulation” so catchy? I can’t speak for others, but I’ve had this song on repeat for these last few days and it never seems to get old. But articulating why I like it? Well, that’s harder to pin down. Maybe I’m just enthralled by this song for non-musical reasons. After all, Sengoku is a very charming character and you cannot divorce her character and personality from this song. As you watch her behavior and listen to her dialogue in the anime, her shyness, earnestness, and honesty already go a long way in making her an appealing character. But while the association to Sengoku Nadeko is there, “Renai Circulation” derives its enjoyment from the way Kana Hanazawa brings out her character. In the beginning, you can hear Sengoku feeling doubtful and wavering over whether to confess her feelings to Araragi. The soft rapping part that follows captures her anxiety-filled monologue quite well since the thoughts aren’t totally coherent and she jumps around a bit. But through it all, Kana Hanazawa’s speed and tone is light and gentle, fitting Sengoku’s demeanor like a glove. This is especially true of the chorus where the fluffiness and cutesy levels are completely off the charts which result in an endearing performance overall. The only part that even gave me pause was the bridge from 2:33-3:05, but that’s hardly a deal-breaker since I’m willing to write it off as Sengoku repeating a mantra to herself to summon the courage needed to take action. Also, the instrumentation doesn’t play as strong a role save for maybe the tuba which helps keep up the rhythm and tempo. Since the focus is pretty much on Hanazawa’s performance anyways, that isn’t really a problem either. Between this song, “Kimi no Shiranai Monogatari,” and “staple stable,” Bakemonogatari has a comfortable monopoly on the catchiest themes of 2009. But it should be noted that these songs have the power to endure. Getting me to listen to “Renai Circulation” repeatedly after it airs is one thing. But doing so about 4-5 months afterwards is a testament to it being more than just a fly-by-nighter. I wouldn’t bet against me listening to this song years down the road. I can’t stop playing it either. It’s cutesy without being annoying to me and ridiculously catchy, especially the chorus. Great review! Yeah, I didn’t expect to fall for it that much, but I’m repeating it over and over and probably going to do a karaoke. Actually, the thing that bothers me the most about the song is the tuba. I generally don’t like the tuba at all, and I kind of wish they’d used a bass to replace it instead. the release date is wrong. the dvd/bd came out like, 1/25 or something. I actually like how the song gives a little bit of something to everyone. even the chorus. it is really catchy i think with the way she breaks down each syllable. and it’s a cute rhyme/charm. Actually, I’d almost go so far as to say that the song defines her personality. I think I got this idea from ghostlightning when he was thinking way too hard about Bakemonogatari, but I can’t locate the exact place where he implied this (assuming he said it at all). 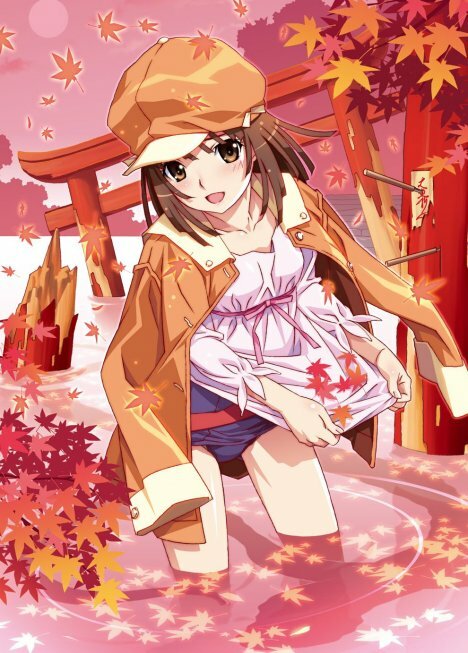 But Nadeko’s personality was only “implied” during her arc, sufficiently established so that we had enough information about her for the plot to advance, but not too much more than that. It wasn’t until the interactions between her and Araragi after the arc was over that we got a better idea of what Nadeko was about, what made her tick and what type of “moe” she fell under. So, before then, it was only really the OP that made her personality explicitly clear. So it was funny, since it served such an important role in the story from the audience’s point of view, without actually actively being a part of it. …FUWA FUWA RI FUWA FUWA RU! The tuba is the manliest instrument ever and it juxtaposes nicely with the moe. Anyone can be moe to xylophones or some other stupid girly instrument. I do not have any great love for the opening themes in Bakemonogatari because I honestly don’t think they function all that well without SHAFT’s visuals. The song is indeed fluffy and nails Nadeko’s personality, but I’m sure this would have been quickly forgotten if used anywhere else. I absolutely adore this song. I’ve also had it endlessly on loop for the past few days (and did the same when I first heard it months ago as well). There’s just something so addictive about Kana Hanazawa’s vocals. The visuals for the OP are dead on brilliant as well. “What’s the big deal? It’s not really anything special” kind of like what I said earlier to 2DT. Well, after 6 listens now, I must say, this song has grown on me…..I also only just noticed the tuba….that might have helped, I don’t know. Song is awesome. (swears to himself for giving in). Rare is a track that can be both cute and catchy. Some, like Caramelldansen can get old. Other forms of bubblegum pop will be annoying. This? Well, this one has that power to captivate and hold your attention for a good amount of time. But yes indeed, quite the cute overload we have going on here. Yeah, it’s pretty obvious in hindsight. When I first heard the song/saw the animation, I could take a gander at what her personality would be like and from the episode after that, the OP is pretty much spot-on in its depiction. Come to think of it, “staple stable” captures Senjougahara’s episode 12 moment too. It was staring at me in the face the whole time and I just didn’t piece it together until they sprang it on us. I’m not sure the visuals are needed here since the strong associations that this song makes with its characters are what really seals the deal for me. So character-focus over the visual aspect. Of course, Yu will disagree since Yu found it to be enjoyable without needing the context, so speaking for me I see it as more of a character song than an OP. An excellent reason to get into Bakemonogatari. Soothing tones and an ED packed to the brim with an energetic piano piece really highlight why the show packs such a solid musical punch for the anime. Even without the visuals (as I’ve mentioned), this song is something that I can get into. But with the visuals, the cuteness levels skyrocket. Somehow, I just can’t get enough of her >o< face towards the end of the OP. Also, it's been a song I've run through my heads to give me a boost of energy when I hike. @Glo Should I rejoice or twiddle my thumbs like an evil mastermind, cackling at getting others into the fold? Either way, glad you enjoyed this stuff and looks like we have two for Team Tuba! It is a character song. It just happens to be the OP too. Personally I don’t think the visuals were really all that great. The song itself would have gotten me all kyun-like regardless what anime it came from. The fact that Bakemonogatari is popular just helped to expose people to Renai Circulation’s radioactive moe powers. I am with Baka-raptor on this in that the tuba is more manly than the timpani, but it takes more than just that to make a good tune. No doubt that timpanis are manly instruments, but they get worked into pop music surprisingly often. Tubas are pretty rare and thus rub the manliness in your face. I think part of why this song is so catchy is because of how Hanazawa expresses herself. She inflects her voice at the right points and sounds.. well.. very into the role. The song also lends itself very well to this. The stressed syllables fall on the beats of the song, emphasizing them. We all know how catchy a good beat is. Also, This song utilizes brassy instruments with minimalistic background noise, and so sounds very unique when compared to most other J-songs these days. I’d give the OP for doing a good job on Nadeko’s facial expressions and that segment where she tries to sidle up to Araragi. Mostly because it was a good depiction of her feelings towards him. As for the visuals themselves, they’re on par with what you’d expect; nothing that you’d call outstanding. Good point. We don’t see the tuba all too much in pop music (much less moe music) so when it’s there, we have no choice but to stand up and take notice! Definitely. The “fuwa fuwa ri” part during the chorus does have that airy feeling that nails the fluffiness factor quite well, so props to Hanazawa for that. When you toss in the melody and beat together into one package, the song becomes positively addicting. Also, definitely. I’m quite pleased with how it manages to remove itself from the generic pop sounds so as to be very memorable. This does mean that I’ll be paying more attention to non-trumpet brass in J-songs now that you’ve brought this point up. I don’t go around posting much on the site, but this – this was just too good to just pass. It’s one of the most catchy (and memorable too) anime songs in a while. This fluffy feeling is just like chips – you just need more of it. Ah also, seen it’s dance video? It’s also good too~ – If you don’t like it till 0:30, you can just burn me on a stick. Thanks for dropping by and no, I haven’t seen the dance video until now. Really well done and the backgrounds work well, especially with the chorus part! ahh no wonder her voice sounded so familiar! Oh, it’s this song! You’re right about the Bakemonogatari songs having longevity, I can have them all on repeat for hours still. Yeah, I chuckled when I realized that. Kana Hanazawa’s stock has been rising for awhile hasn’t it? I might not have liked Zange as a character, but she did do a good job making her sound conniving and seductive. And here, she turns up the charm with Nadeko really well. Oh man, watching Zange attempt to be charming, but singing off-tune had me in stitches during that segment. The drama between her and Tsumugi was entertaining to sit through. I’m late to the party but I need to throw in my 2 cents. I must have watched the tv size of the OP about 50 times on you tube before it came out. I even listened to that crappy loop someone made and called it full size. While I will agree that tuba+moe is an uncommon combination. I don’t find the tuba all that remarkable, it certainly keeps the pace but doesn’t do anything really complicated. Granted it’s rather hard to get too complicated with a tuba. I still point towards Kobato’s ED for combination of less moe but better Tuba. http://www.youtube.com/watch?v=LaQx0oMBbQg. Coincidentally both of these songs came out around the same time. Kobato ED isn’t infectious though. Yeah, Jellyfish no Kouhaku doesn’t have the catchiness even if it’s a pleasant air. I’d also say that the tuba isn’t as apparent, but its fitting into the song and functions more than a rhythmic indicator. Also, definitely agree with the little exclamations that Hanazawa puts out during that segment. The charm factor increases quite a bit in that part. Renai Circulation seems to be the new hottest thing recently. I agree that it’s catchy, beautiful, and just really pleasant. However, I just don’t seem to love it as much as some others. It’s an interesting dichotomy, that’s for sure. Two halves that normally don’t work, but here are in harmony creating something rather cute, earnest, and enjoyable.